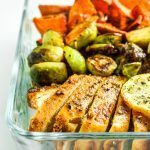 This blackened chicken sheet pan dinner with sweet potatoes and brussels sprouts is easy, healthy, and quick. Perfect for weeknight dinners and meal prep! Preheat the oven to 400º. Line a baking sheet with parchment paper or spray with cooking oil. Mix together the ingredients for blackening seasoning in a small bowl. Place chicken breasts on the baking sheet and sprinkle with seasoning, flip and repeat. Spread sweet potatoes and brussels sprouts in the remaining space on the sheet pan. Drizzle with olive oil. Sprinkle seasonings and garlic. Place into the oven and bake 20-25 minutes, removing halfway to flip chicken and gently toss veggies. This recipe yielded enough for 4 servings for us.